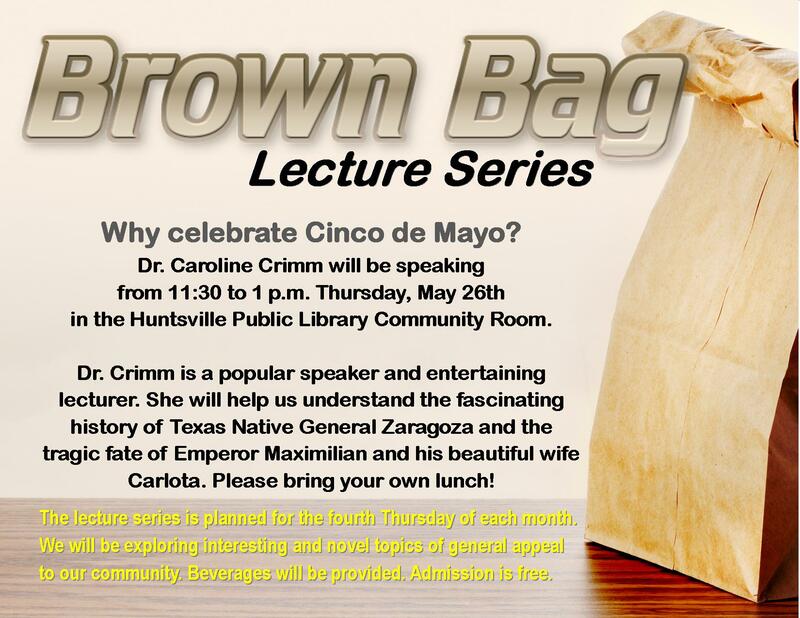 The Huntsville Public Library will be starting a Brown Bag Lecture Series in May. The series is a free event that will kick off Thursday, May 26. Attendees may bring a brown-bag lunch. Lunch time begins at 11:30 and the lecture will begin at noon. The lecture series is planned for the fourth Thursday of each month. Some of the topics that will be explored include interesting and novel topics of general appeal to Huntsville. Beverages will be provided. Admission is free. The first lecture in the series will focus on Cinco de Mayo. Come find out why Hispanics celebrate this day. The lecture will be presented by Caroline Crimm, PhD. Dr. Crimm is a popular speaker and entertaining lecturer. Her lecture will focus on understanding the fascinating history of Texas Native General Zaragoza, as well as the tragic fate of Emperor Maximilian and his beautiful wife Carlota. For more information, call Adult Services Coordinator Mary Kokot at 936-291-5471. More details about future programs will be featured on the HPL website at www.myhuntsvillelibrary.com.